Wed., 19 Jun. - Sat., 22 Jun. Fri., 31 May - Sat., 22 Jun. Fri., 21 Jun. - Tue., 25 Jun. Sun., 16 Jun. - Wed., 26 Jun. Mon., 20 May - Fri., 21 Jun. Wed., 24 Jul. - Sun., 28 Jul. Sat., 15 Jun. - Sun., 23 Jun. Mon., 27 May - Tue., 4 Jun. Wed., 29 May - Wed., 19 Jun. Wed., 26 Jun. - Sat., 29 Jun. Thu., 6 Jun. - Wed., 12 Jun. Thu., 30 May - Sun., 2 Jun. Wed., 16 Oct. - Sat., 19 Oct. Tue., 23 Jul. - Mon., 29 Jul. Thu., 6 Jun. - Thu., 13 Jun. 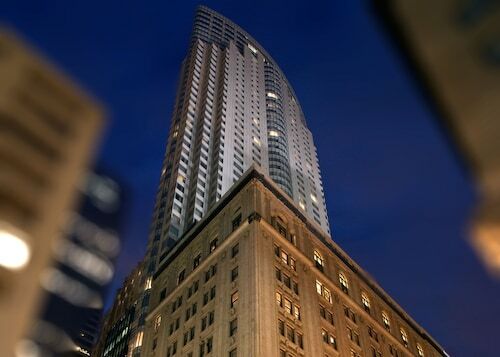 Conveniently located at the corner of King and Yonge streets, One King West connects you to Toronto’s downtown business, entertainment, and shopping districts. 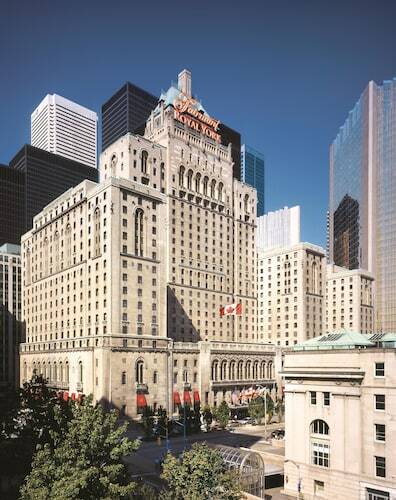 Set in the dynamic business district, The Fairmont Royal York hotel, built in 1929, is across the street from Union Station, 2 blocks from the convention center and Scotiabank Arena, and 3 blocks from CN Tower. 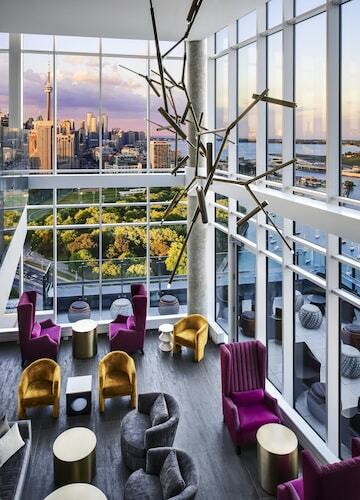 Set along Lake Ontario, this 38-story hotel on Toronto's waterfront is within 2 blocks of Air Canada Centre and near the CN Tower. 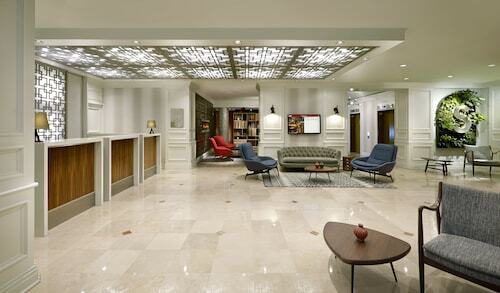 25 km (15 mi) from Lester B Pearson International Airport. 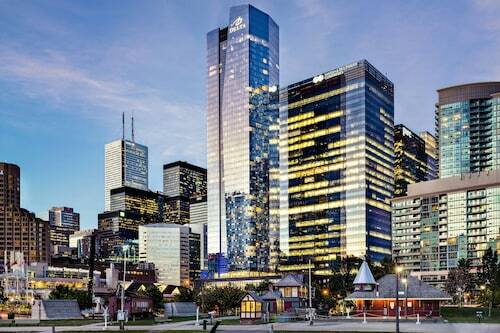 Located in Toronto's theatre/entertainment district, this hotel is within 0.4 km (0.3 mi) of the Princess of Wales Theatre, CN Tower, the Metro Toronto Convention Centre, and Rogers Centre. This family-friendly Toronto hotel is located on the boardwalk, within a 10-minute walk of Exhibition Place and Ontario Place. Rogers Centre and CN Tower are also within 2 mi (3 km). Toronto Exhibition Station is 8 minutes by foot. Located downtown in Toronto's theatre and financial districts, this smoke-free hotel is across the street from Union Station/VIA Rail and 2 blocks from the Air Canada Centre, Rogers Centre, Metro Toronto Convention Centre, and CN Tower. 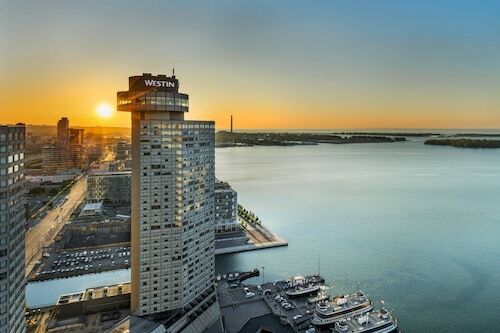 Located on Toronto's Harbourfront, this smoke-free hotel is 2 blocks from the Metro Toronto Convention Centre and 3 blocks from CN Tower and Rogers Centre. YHM-John C. Munro Hamilton Intl. Question : How much is a plane ticket to Toronto (YTZ) from Halifax (YHZ)? Answer : Prices range from $323 to $961. Booking far in advance can normally help you get the cheapest ticket. However, usually the sooner you book, the more you'll be able to save. Question : How long do most people stay on their visit to Toronto? Answer : Of course, you're not most people, but if you were, you'd stay about about one week. Question : How long does it take to fly from Halifax to Toronto? Answer : If you're able to take the direct flight (which is offered by Porter Airlines), you will be able to leave YHZ at 11:00 AM ADT and get to YTZ at 12:55 PM EDT (two hours and 55 minutes). Remember, there is a one hour time difference. Question : How long is the flight from YHZ to YTZ? Answer : Porter Airlines currently holds the shortest travel time with two hours and 55 minutes. For example, you would arrive in Toronto at 12:55 PM EDT if you left Halifax at 11:00 AM ADT. Remember, there is a time change of one hour. Answer : The cheapest day to fly from Halifax to Toronto is on Tuesday. If you want to save a bit of money on your next business trip look for flights on that day. Question : How many flights are there per day from Halifax to Toronto? Answer : Each day is different, but on average, you can expect to see only one available departure time. You won't have as many choices on this route as most other routes departing Canada. Answer : If you are wanting to save, look at May 1st. As of Apr 22nd, it's showing the cheapest ticket at $352. That is 30% below the average price for this route, so you can spend that extra money on some souvenirs. I was not expecting the airline to be such welcoming or comfortable. The flight taxi and landing was very good and both the checkin and on board services were superb! Flight attendants were amazing and so nice. I think Porter's staff are extremely friendly and helpful. Would be nice to be able to plug in my computer when on board.